NORMAN BAKER is lead singer/songwriter with THE REFORM CLUB who to date have released two albums. 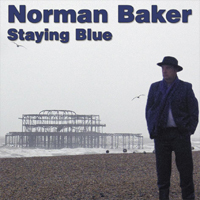 “Staying Blue” is his first solo effort and is an eclectic mix of blues, country, jazz and folk songs. ...Not for nothing there's a call-out to Mr. Metronome in the crooning of "Nice And Loose" which is set to the old-timey acoustic backing, whereas the folksy fiddle and lap steel drive "It Cuts No Ice" and its "Que Sera, Sera" reference towards sweet fatalism, so time is fluid here. That's why "Lowdown Blues" - which is limited to vocals and guitar - has a high-ground hope in the piece's heart, as does the raw plea of "Just Stay Blue" pouring out sadness to make room for purer, albeit harp-smeared, plans: Norman needs a solid point to hold on to. While Brighton Pier from the record's cover is rather rigid, "Slipping Through My Fingers" will find Baker doubting the permanence of his personal stability and looking for the glorious trumpets of freedom in other waters. Spanish drama behind "The Woman In Grey" and the delicious serenade in "The Belly Of The Beast" should provide him with emotional anchor, yet the unplugged encore "Perhaps" is able to locate it in simple truths. Don't let the name fool you: the record comprises eleven tracks which span an eclectic range of genres, from blues to jazz, folk to country, there's even a sea shanty in there for good measure ('Shipping Forecast', complete with its very own music video)...Favourite moments are 'It Cuts No Ice', a catchy country tune with a fair stab at an American accent to boot, and a lovely acoustic folk number 'Perhaps'. It has to be remarked that, whilst Baker's bitter-sweet vocals are perhaps an acquired taste, there's a bravery associated with putting one's heart and soul "out there", so while he may be short of a Baker's Dozen, these eleven tracks are hopefully the first of many improved songs to be recorded and released in future. A competent, offbeat, somewhat appealing collection and so worth a second motion.